Panasonic EW1211, the compact complement to your oral hygiene regime. Get rid of food residues from areas where even the best toothbrush can’t reach. -Jet mode: a powerful and pulsating high-pressure water jet shoots directly between the teeth. -Air in jet mode: pulsating streams of water mixed with air shoot intermittently to clean periodontal pockets and stimulate the gums. You can maintain and improve your oral hygiene with inter-dental care, periodontal pocket care and gum care. 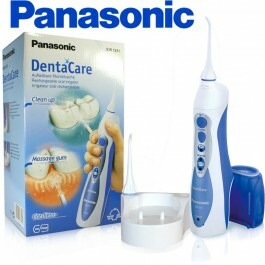 In fact, Panasonic EW1211 not only cleans your teeth, it also gently massages and cares for your gums. The EW1211's water tank is completely removable. This means you can quite simply rinse it out with warm water and a gentle detergent – there's nothing to it. A full tank of water provides around 35 seconds of use between re-filling. Choose between three different modes. Select 'Jet' for powerful removal of food particles, 'Regular Air In' for massaging gums and rinsing, or 'Soft Air In' for gentle massaging. Panasonic EW1211 is completely washable, making cleaning extremely easy. You don't have to worry about either calcium deposits or food residues. * Removable tank is dishwasher safe. The EW1211's charging station is safe and easy to clean. In fact, it's completely non-contact to safely prevent damage from water and spray. In addition the counter top charger is equipped with a nozzle stand and is wall-mountable. Easy to grip and easy to fill with water. 130 ml tank volume. Waterproof and washable. Non-contact recharger. Easy to keep clean. Equipped with nozzle stand. Charge base is wall-mountable, with 2 screws included. One full charge provides approximately 15 minutes of use. Charge indicator light on main unit. Full tank of water will provide around 35 seconds of use between re-filling. Powerful water jet removes food debris and massages gums. Removes the bacteria that cause plaque. 3 modes: Jet - for removing food particles trapped between teeth; Normal Air In - for removing particles, massaging gums and rinsing between teeth and gums; Soft Air In - for gently massaging the gums.